As Christmas approached we came closer and closer to that point of no return where your realize all your preparation and planning must soon be abandoned. This usually happens about mid day on Christmas Eve. No more decorating. No more cooking. No more shopping. We just have to go into it with all we have and hope for the best. As in all years past this is always quite sufficient for an excellent holiday. 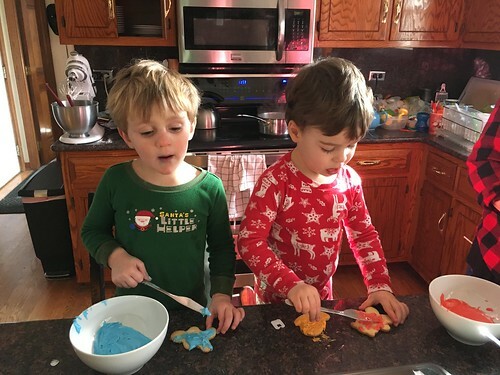 The boys helped Jen with her holiday baking which meant she got about 75% as much baking done as normal. 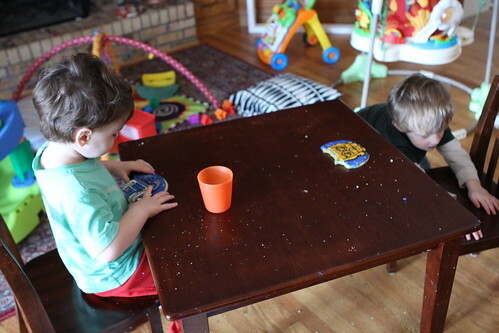 However, the boys were courteous enough to consume just as much icing as ended up on cookies. When asked to stop Elliott gave his traditional response of, "But it's so yummy!" Martin has taken to drawing in his room when it's time to be sleeping. 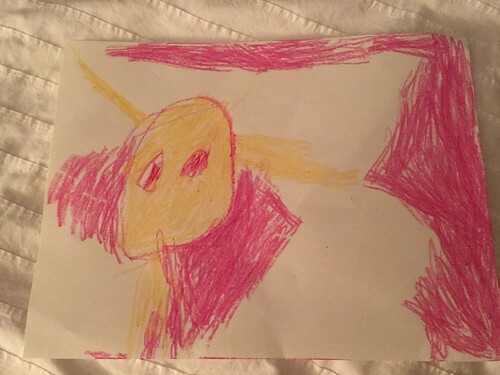 The other night he drew what he described as Iron Man shooting Donald Duck. Not sure I see Donald but the Iron Man is pretty spot on. Uncle Joe and Uncle Ryan came over to meet Josephine for the first time. She was quite fond of both of them. They brought Star Wars cookies and Star Wars toys for the boys. They got an A+ rating from the boys for this visit. Flawlessly done, gentlemen. Aunt Lisa came over on Christmas Eve and participated in the pre-game at Grandma and Grandad's house. Martin and Elliott immediately set up their new bowling set in the hallway to make sure they were completely underfoot int he lead up to dinner. Before dinner Grandma read from one of the books to three captivated children. 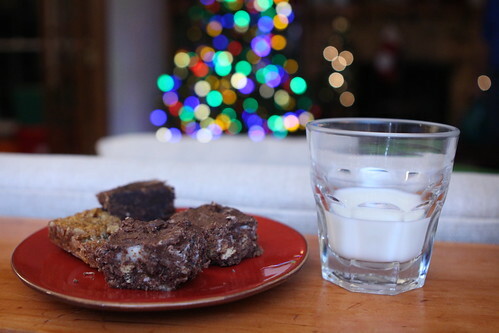 The boys selected an assortment of bars and milk for Santa and Elliott even pulled up a chair so he could take a load off. Santa arrived after a stint in Brazil to head to the next logical place: the Midwest of the United States. There he did a pretty good job of setting up the tree. He used tinsel this year, something he has threatened to do for many years running but often was just too lazy to follow through on. 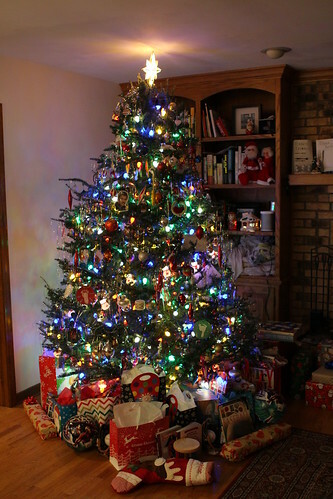 Since the gathering is growing each year the presents for adults had to be held in a separate overflow room. 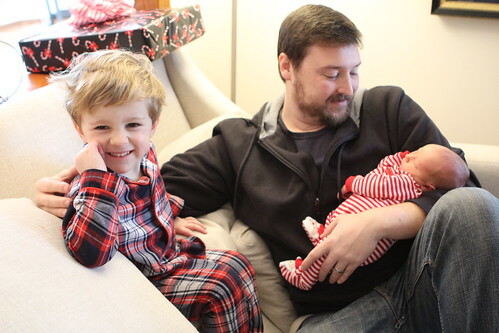 On Christmas Morning the stockings were discovered by the boys and even the normally groggy Elliott couldn't help but perk up instantly as he rifled through his first gifts. The best gift of all was that cousin Oliver (no relation to the cousin Oliver in The Brady Bunch) was released from the hospital a day early on Christmas Eve and got to spend the day with us being the sleepiest and most well behaved child of the cousins. Already a Christmas tradition is Elliott deciding he's had enough excitement and needing some alone time. He had a blast breaking free to use his new Thor hammer and Captain America shield outside. Since it was so unseasonably warm he was able to do this all in just his pajamas. 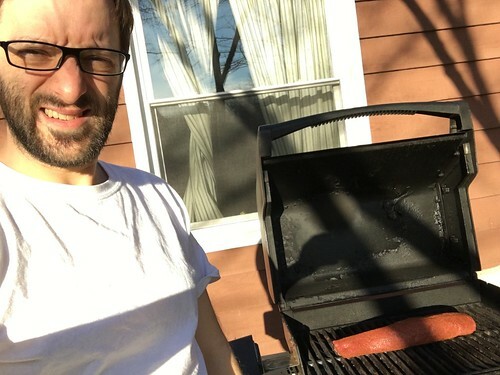 I even got to grill outside in a T-shirt. It was even a little too warm in the house from the oven running, something I've never had to contend with on Christmas. Personally I prefer ice cold, snowy days for Christmas but it was a nice novelty. 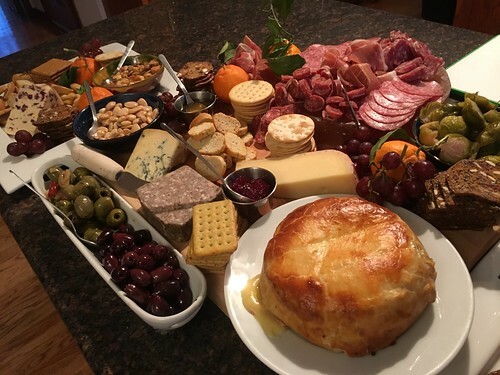 I put some time into the Christmas cheese platter which extended most of the length of our counter and was a great start to keeping everyone occupied and fed until the relatively light dinner was served. 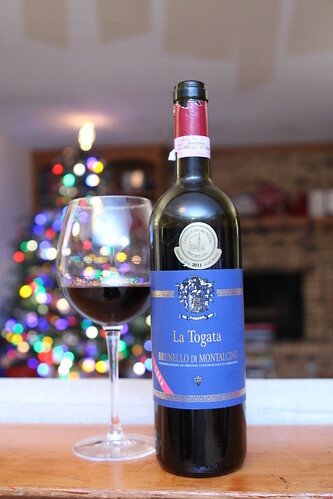 We opened this wonderful bottle of wine purchased for us by Jen's Nana which paired perfectly with the meats and cheeses. For dinner we had Beef Wellington, roasted vegetables, and duck fat roasted potatoes. Dinner definitely took a backseat to the first course. The lights I'd hung (unsafely, as many friends and family would later tell me) in the sun room made for a wonderful atmosphere, negating the need for our horrible, oppressive overhead lights. The next morning Nana took over with the three highest maintenance children by reading them Storybots. She even got a new iPad for Christmas in order to be able to hold even more Storybots for the kids. The boys had a great morning and afternoon as they watched Star Wars, and The Empire Strikes Back while hanging out in their brand new Rylo Ken sleeping bags while holding their light up lightsabers. Martin and Elliott both got really nice art sets from Nana and they had a fun afternoon using them to color with Nana. Elliott woke up in the night after Nana and Grandpa headed home feeling sick. The next morning would have been his first back at school but he spent most of the morning on the couch being extremely lethargic and watching Dragons. Then all of a sudden he perked up and decided he was perfectly fine and consumed huge amounts of food after eating nothing all morning. The wellness was short lived but overall he was better by the following morning. We got a pretty horrible ice storm followed by a snowstorm which meant a little shoveling. Elliott was so excited to shovel that he just pestered me to go out and shovel the entire time I was meeting with a contractor to get a quote on carpeting the basement. I think he may have chased the nice man away just so that we could get to the joy of shoveling. I'm pretty sure this behavior will not be replicated when he is fourteen. Monday I received news that my Auntie Vi had passed away. Auntie Vi was an amazing woman and like a second grandmother to me. 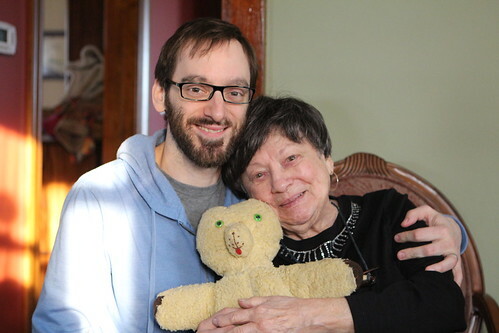 She bought me my favorite teddy bear when I was a baby, the teddy bear I posed with in the above picture a few years back. 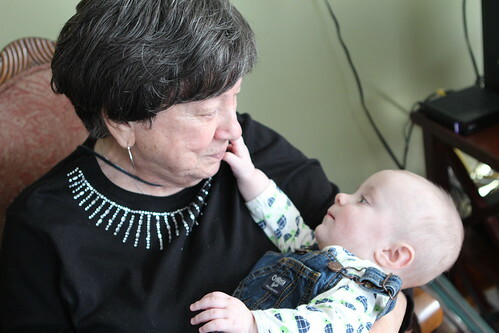 When the boys were about six months old we made the drive to Rhode Island and she was able to meet them for the first time. I'm glad she was able to meet the boys a couple of times and always enjoyed seeing pictures of them. It's unfortunate that she didn't get a chance to meet Josephine. She would have loved her. 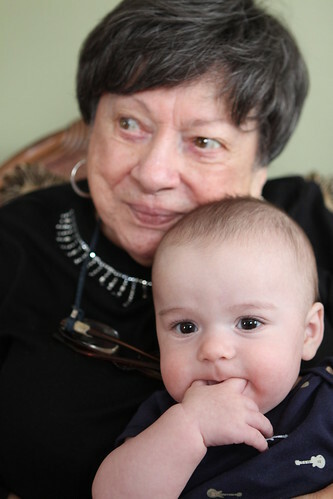 I spent every Christmas of my life with my Auntie Vi until the boys were born in 2012. Christmas for me was always spent at her house, and later my cousin Lisa's. While I love spending Christmas with my family I always miss those family members that I no longer get to see during the holidays. Despite reminding me that I was a "rotten kid" every time she had the chance, she was a kind and loving woman who was always laughing loudly about something or another. I've never known her to be in a bad mood or to say a bad word about anyone. Except for me as a kid. We'll miss you, Auntie Vi.